I'm leaving the city for the rest of the week for work. As the empty cross in this work by Nicanor Parra's "Obras Públicas" says, I'll be right back. 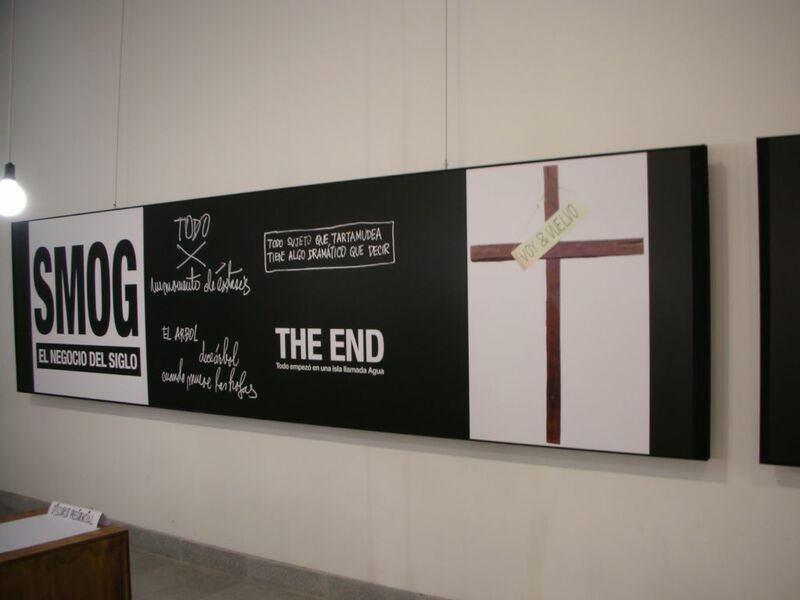 Do you remember I told you this exhibit was controversial? This work is another reason for that. Chile is a very Catholic country and this kind of work can be quite disturbing for some people. Its interestin to see the 3 panels together. 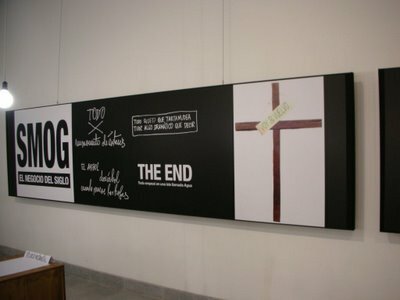 Smog-the end- and the cross. Good capture and I am looking forward to your return. probleme d'anglais, mais j'avoue ne pas comprendre ce que l'eglise interdit ? pour repondre à ta question sur la statue d'atlas : la statue se trouve sous cet arbre, pour une raison, cet arbre protege naturellement cette vieille statue. English problem, but do I acknowledge to understand only the church prohibited? to answer your question about the statue of atlas: the statue is under this tree, for a reason, this tree protects this old statue naturally. Ha sido muy grato para mi ver estas imagenes. Soy nuevo en esto de los blogs y revisando e intruseando llegue al tuyo. I want this blog in spanish, there are a copy in some other languaje?. Well my english it's no so good. OK, as long as you're coming back. At first I read "THE END" and thought - we'll it's only 3 January!!! I like this art work. It is good to challenge people's thinking. Yeah, if you want to make polemic and be heard all over the world it's a good way to do it!